Remember This? : Pre-Made S’mores | I'm not stalking you. Can’t you just slap them together and microwave them yourself? Bonus entertainment value I’m thinking…. have you ever watched a marshmallow grow in the old nuker? Go on YouTube and look up peeps jousting! Where is your American Spirit? Why make it myself when I could buy it already processed and preserved for my pleasurable consumption? Some assembly required, no camp residue… place one graham cracker in the microwave for 8 or 9 seconds, add chocolate and other graham for a similar affect. I make these for the kiddos and myself sometimes. Are you serious??!! You don’t like s’mores while camping?? I mean who cares if you have dirt on your hands and they end up sticky from eating them! That’s a major part of the camping experience! They do have wipes and all kinds of ways to clean up before you devour your s’mores nowadays. But, it sounds like you are not a true outdoorsy person who really enjoys the whole camping experience to me. Stay home in your uptown suburb and leave the great outdoors to people like me who really enjoy it, all of it!!!! I am not denying that. I am not a true outdoorsy person. But when I met my husband, he introduced me to camping. And while I am not fond of mosquitoes or dirt imbedded into my scalp, I do enjoy sleeping in a tent, the camping supplies such as mess kits, and the peacefulness of the early morning sun and fresh air as I walk up to the campground bathrooms in my pajamas because I really hate using porta-potties. Russel stover makes some pretty large prepackaged s’mores now… They also come with caramel inside (the better of the two versions by far). They don’t market them as microwaveable but you certainly can… Delicious! My kids dont believe me , that this was a real snack anytime! I thought I had imagined these from my youth. I spent more time than I would care to admit researching them, as I didn’t remember the name, manufacturer, or the commercial – just that they were premade, came in a red package, and were AWESOME. I just happpened to come across your blog post, and was instantly transported back to my youth. Thank you for giving light to what I thought was lost, and also for being a kindred spirit in thinking that these were superior to homemade S’mores. Thank you so much for stopping by! 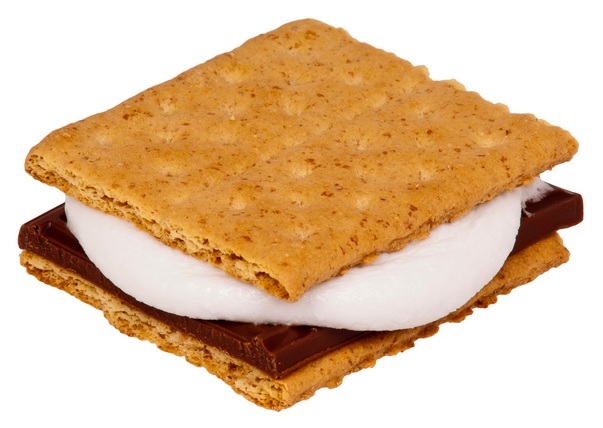 I wish I had one of those S’mores right now. I don’t remember Magic Middles but it seems like I should. I want Micro Magic foods back too.